Welcome to my cluttered world! I can't be neat! I try but as soon as I organize I can't find anything, I am just a cluttered person! 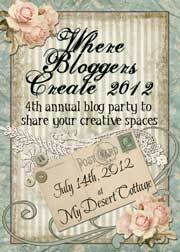 This is my first time joining My Desert Cottage for Where Bloggers Create. I was a bit timid at first because I don't have a beautiful organized space but here is my messy studio for everyone to see. I design hooked rugs and wool applique. 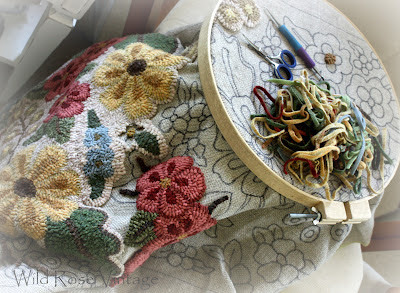 I also love to crochet, mostly with fine thread, embroider and piece quilts. This is my chair where most of my handwork is done. If you click on the pictures you can see so much more! One of my many 'hoarded' Singer Featherweight sewing machines for sewing quilts. I will not piece a quilt on any other machine! My overly cluttered counter and underneath is storage. where I spend waaay too much time on the internet! The vintage aqua phone that I found for a steal, and it works! Still waiting for Mr. Wild to spray paint that file cabinet for me! A few rugs I have hooked. Thanks for taking the time to look around, I can't wait to visit all of you and get inspired! Come and join in the fun at Karen's party! Oh my! What a lovely space to quilt and make your gorgeous rugs, quilts, and crochet projects. 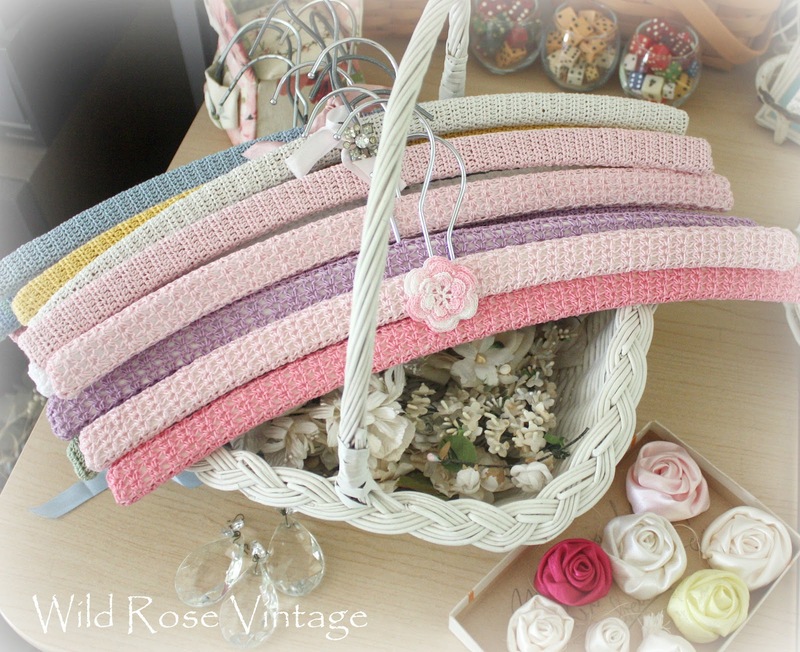 Those crocheted hangers are lovely! I love using glass jars to hold supplies too. It's like being in a candy store looking at all the buttons and other lovelies. Love your sweet feather weight. They are great little machines. That's a pretty well organized mess to me. I still love that little kitty cat shelf. I'm going to pop on over and see some other people's places. I love getting a little glimpse into people's spaces. OH I love it, Faye! So much eye candy to get you inspired! It all looks WONDERFUL to me! Your place is wonderful!! 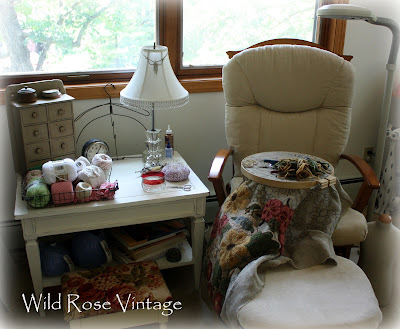 I love that sewing machine.....and those lovely rugs and quilts you've made! They are awesome. Your love for vintage really shows and it's wonderful to see such lovely eye candy!! i LOVE your room! Love the long countertop...and the storage it has. Your vignettes are pretty and your rug hooking is AWESOME! Thanks for the tour and I'm glad you joined in the fun! Your hooked rugs are simply gorgeous! I also love all the button containers. I don't see clutter at all; I see beautiful inspiration! Oh I just love spaces like this,they are so interesting. What a lovely supply of bits and pieces you have. Drool! there is so much I love about this post....your space is amazing. your embroidery work is stunning. did I see a couple drawers full of crochet lace?!!!! 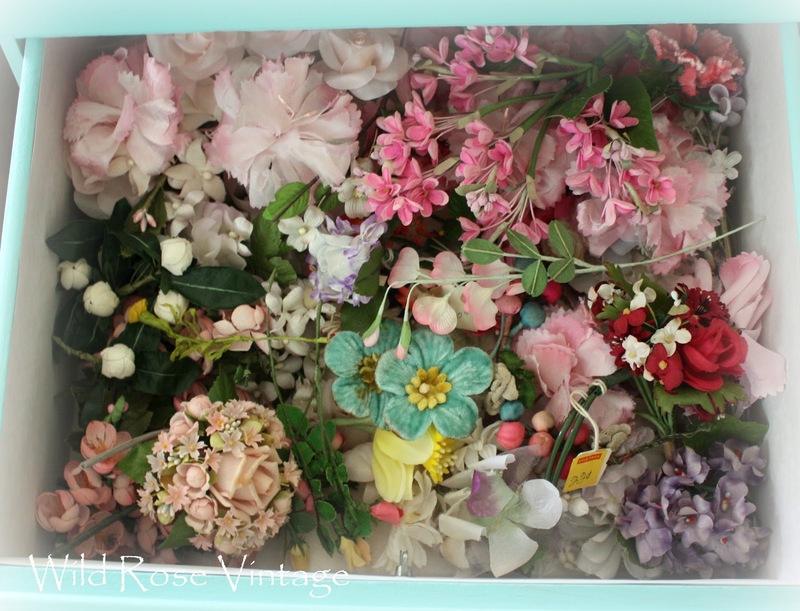 your vintage jars full of buttons, buttons and more buttons! I am so happy I stopped by to visit with you. this is the first year I've joined in on all the fun...and I do hope you'll visit with me too. What a wonderful space you have! I'm visiting from Where Bloggers Create. Love all your cute things :) Happy weekend to you! Wow! Your work is beautiful! Some day I am going to learn how to hook a rug. I love all your glass jars. Everything looks so pretty in them. I think I will go to Home Goods and pick up a few. Thank you for the idea! Another beautiful space. I love the hooked rug design - I think I NEED to learn how to do that! Thanks for having me and I hope you can visit me soon! 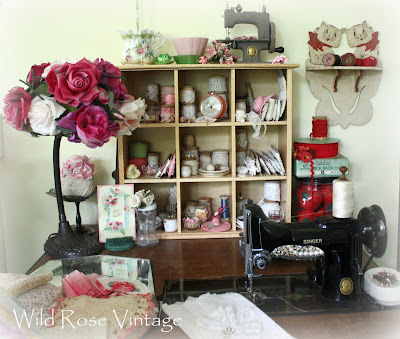 Oh I love your jars, lace and vintage / antique goodies! What a beautiful place to create. I used to hook rugs a very long time ago - your work is lovely! A lovely space! 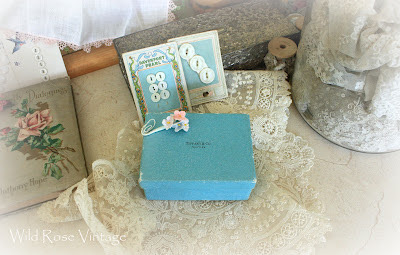 I love your vintage embellishments and vignettes... I need to get my "spcae" organized and pretty so I can join one of these someday. For now, I share my office with the hubs! Maybe next year! Wow everything looks wonderful. Love those hangers you did...they are so pretty. I love stuff like that. Your area is sweet and so creative. I bet you get loads of ideas when you are in your creative place! Love it. I think your space is beautiful and it certainly looks organized to me!! 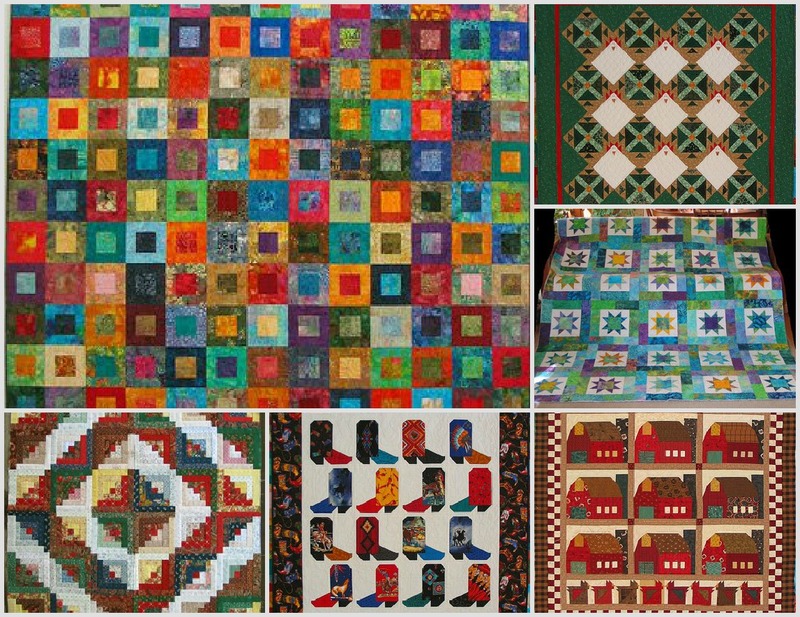 I'm a quilter, too...at least, I was until I started doing machine embroidered items to sell. 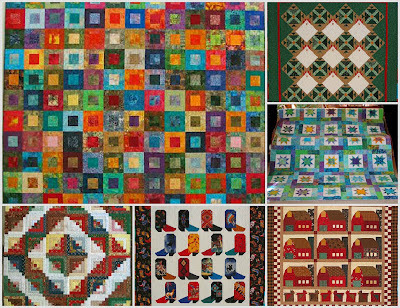 Your quilts are beautiful and I am in awe of your hooked rugs. Just gorgeous!! 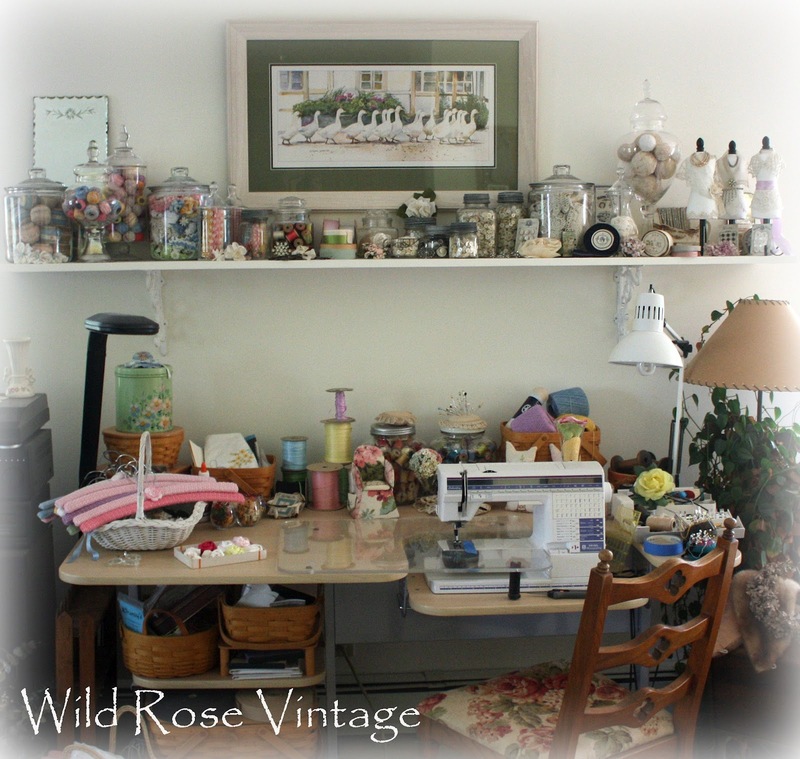 You are very organized with so many vintage treasures to work with in your creative spaces. You display everything so nice, and pretty too! Oh, how wonderful! You are so talented . . . I am envious of that beautiful knit and quitting work that you do!!!!! And your creative space makes me so happy!! Thanks for sharing! Awesome space, I love your crocheted hangers, so crafty! Your rugs are beautiful, Faye! Great space. I love all those jars filled with buttons. They make for a great way to organize and look so pretty, too. Thanks for sharing your tour! Loved seeing your pretty space and the gorgeous rugs and pretty crochet you do!!! I have a new space to share this year too- sure been fun seeing all the great spaces at Karen's party! EEEK! I love all those drawers filled to the brim with goodies! A beautiful space! Your space looks awesome Faye. It makes me want to haul out my rug hooking and get back to it! Your rooms nit untidy it's just full of lovely and useful things. Your rugs look really nice, I've never tried rug making, though I have been saving lots of scraps of fabric for a rag rug I am goi.g to make 'one day'! Seeing your collection of crochet thread again reminds me I want to learn how to crochet (if I only had time), the colours are beautiful. You also have some lovely lace that I am a tad jealous of. Thank you for the look around your lovely studio. I love your bolts of lace in the aqua drawers. 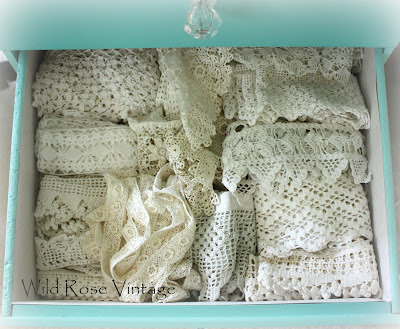 I go to every antique show for long bolts of lace but I haven't been able to find much of it lately. I adore your studio and the comfort and cozy atmosphere.Your work is just gorgeous!! !Pat Beglin Come visit me sometime . Hey! another newbie to the party! So am I! You might feel like your space isn't decorated the way you want others to see it, but I saw a lot of beauty there. 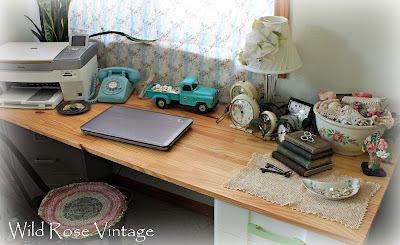 The zinc tops on the canning jars for storage... your beautiful hooked rugs (something I always wanted to learn).. your collection of clocks on the desk.. and the phone! the phone is priceless! Lots of treasures and thanks for sharing! If you have a minute, drop by my place. I would love to have you! What a great space Faye! Lovin' all your little collections you have displayed too! Oh my, a girl after my own heart! I love embroidery as well. Love all your displays and storage ideas. Thank you for the tour around your studio. Meowllo! Allow me to introduce myself....I am Romeo. THE one and only Romeo who roams the back alleys of blogland leaving my mark. No, don't worry, not THAT kind of mark. Ew. No, I just stop by, admire your post and let you know I was here. Of course if you leave milk and tuna out, I will assume you left it for me. Kind of like when Santa comes to visit. So now that I have formally introduced myself may I tell you that I don't mind a "messy" studio area at all! Nope, not one bit! After all when a guy is tired from all the internet traveling, it's nice to find someplace soft and comfy where I can rest my weary paws. And if the surroundings are beautiful like yours, well then I may stay even longer for a nap! So that would make your studio a purrfect place for me. Of course while I'm here I promise I will NOT climb up on the shelf with all the beautiful glass containers. That could be hazardous to my guest status. 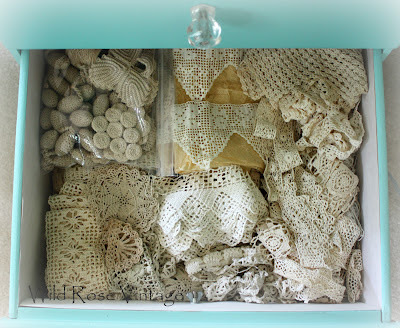 However, would you mind opening up one of those drawers in the aqua cabinet for me, I think I saw some of those crocheted ball trims beckoning to me. Or maybe it was the ducks on the wall (The Dinner Call). "She" had a cross stitch pattern for that. Probably still does. Unfinished of course. Thanks for sharing your wonderful creative area, I certainly enjoyed my visit! You have such a pretty room, and I love that Featherweight machine! Well Faye your studio looks in no way "cluttered" to my eyes. You are so talented in designing those very beautiful wool rugs, crocheted hangers, quilts etc. etc. 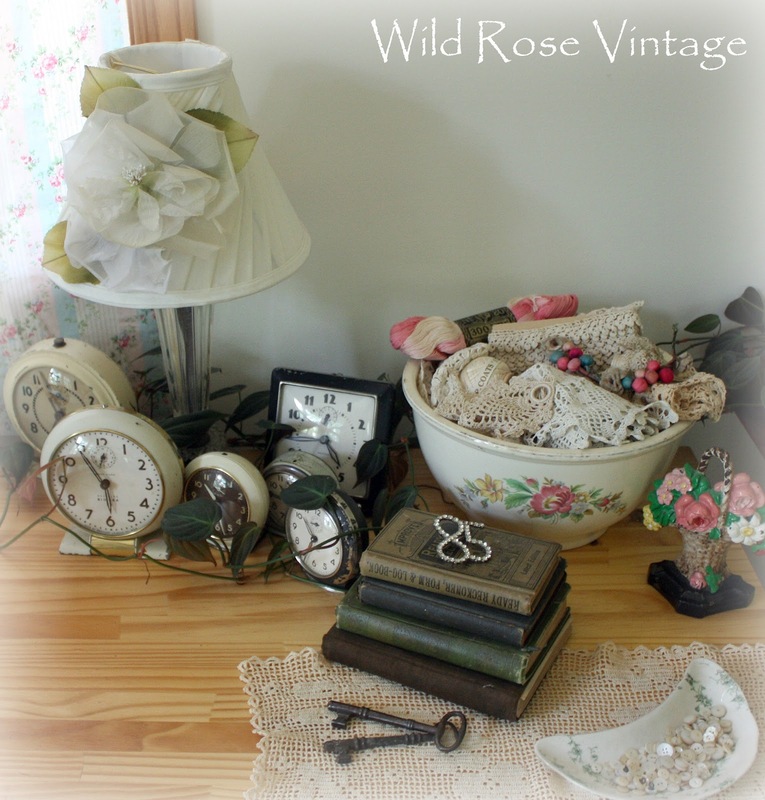 And I love your little collections of laces, clocks, containers of buttons and Oh that vintage rose hat is extraordinary and looks so neat hanging over your lamp near that neat little sweing machine. Thanks for sharing it with us - I know what it's like being a newbie as I am one too! 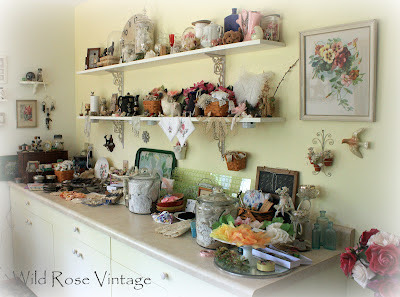 LOVE the way you display in apothocary jars - especially the buttons - and oh my, those drawers of lace - YUM! Thank you for sharing. I have to agree - your disorganized with snippets looks wonderful to me. All the lace and the beautiful embellishments, it looks 'in use' and fabulous! All those button jars and things a re making my fingers itch - I'd love a closer look. I can even picture you in your chair creating. THanks so much for sharing your space. ohhh...look at the drawers filled with lace...your room is SO pretty! And I love seeing your trailer...we're almost finished...kt's been fun?! Love your studio! I have tried several times to crochet - with no avail - I did create a backing to a yarn rug (with HUGE crochet stitches) then knotted in pieces of yarn. I can embroider and sew, and took a tatting class which almost put me in a mental hospital. I peeked at a few of your other posts as well - LOVE your Glamper! Love your studio! 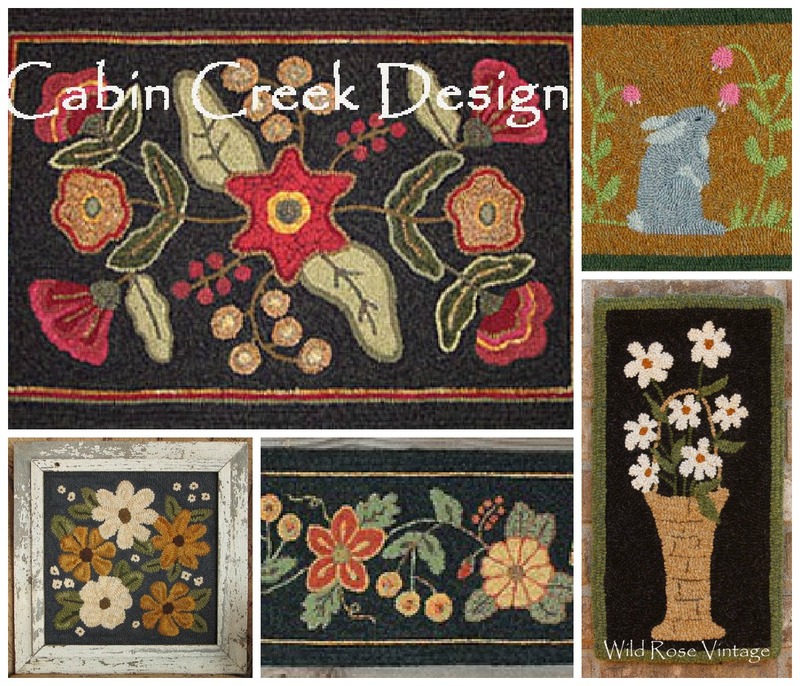 I have always wanted to try rug hooking, yours are exquisite! Thank you for sharing. Your Studio showed off beautifully. You have such a pretty studio. I love your collection of lace...so beautiful!! And both the hat on the lamp, and the aqua pick-up truck are perfect touches of whimsy! It's the perfect for you to create - and you create beautifully! I started at the bottom of the list because I think most started at the top. Look at all those buttons, oh my and laces and colors. Great place to create. right at your fingertips. I love what you do and where you do it. It is beautiful and reminds me of me! Come say hi! I LOVE your room! 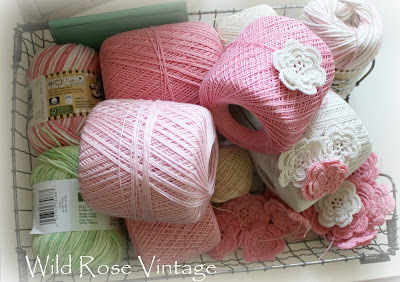 I love to hunt for old crochet pieces and thread at garage sales. Someday I would like to do a rug as well. I have crocheted a few, but would like to hook one sometime. I have already started to collect bits of wool. Thanks for sharing!! Its beautiful organized clutter! I love it! There are some really wonderful things in there that I would love to play with !! Lucky you!!! Thank you so much for joining the party and letting us have a peak! What a beautiful space you have created! I don't understand why you think it is messy, I thought it was very organized. I know there are some pretty spectacular spaces on this blog hop, and I love looking at them, but I also wonder if some of those people MAKE anything or if they just have beautiful rooms! Your room is beautiful and used, what a perfect combination. I knew I had to start following your blog because you create such lovely things and I like your style so much. Thank you for participating in WBC and showing us all your space. 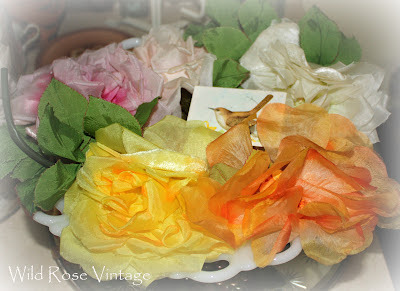 I found your wonderful blog and I am so happy! Well, I was almost out the door but I couldn't resist taking a peek at your studio. LOVE it all, especially your jars and the Tiffany blues. That phone takes me back. LOVE the color. I've been meaning to find a black rotary for a while. Thanks for reminding me. I'm coming in here late for this party. But I wanted to tell you I love your rugs! My grandmother used to make rugs like that. And how fun is that phone!! Thank you for sharing your space. Thank you for sharing your creating space. 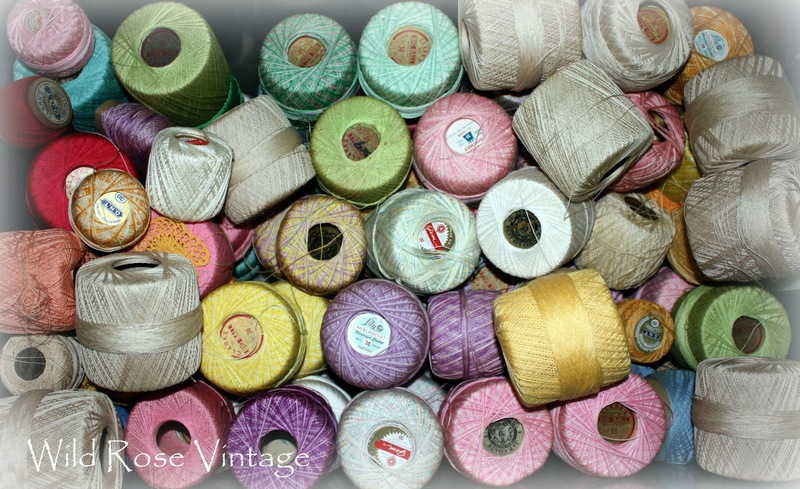 I would love to collect laces and vintage thread. It's all so inviting. Love your gorgeous space. You do so many lovely crafts. I'd love to hook rugs, too. Is it hard?